It can pour down in this city, even to the extend that it had flooded in recent years. Not to the extend where your life is in danger, but just enough to make travel uncomfortable. The good news is that the Thai authorities have taken some drastic measures in recent times to navigate flood water pouring into the Chaphraya River from the north down to the sea. 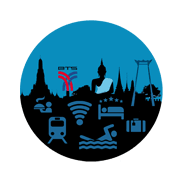 Nevertheless, don't get caught unawares or without an umbrella and before starting to look for the best Thailand hotel deals, lets see what you can more or less expect from the weather in Bangkok. Like most of Thailand the city enjoys a warm tropical climate. High temperatures and humidity soar from March through May with temperatures reaching between 30 and 40 degrees Celsius. November to end February is the dry months with very little rainfall and temperatures in the mid 30 degree mark. The rainy season is experienced from May to October with September seeing the most rain with up to 12 inches per day.